The most beautiful wall clocks for your home! Fine wall clocks are a functional eye-catcher and decorate the kitchen, entrance hall, living room, dining room and bedroom. Selected and innovative materials such as concrete, aluminium, fine woods, plastic or ceramic give your home an individual look that you can complement with other home accessories. 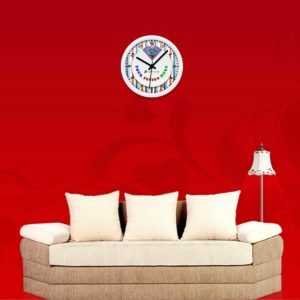 The designer wall clocks in their online shop are also equipped with a high-quality quartz movement, which guarantees perfect timing even in the long term. Incidentally, their radio clocks, which are set by a radio time signal, are particularly precise. Setup tip: Make your clock in style and adjust its diameter to the height of the wall. Think Big and choose a clearly visible place. Incidentally, you can easily order all designer watches from their shop just like matching wall accessories to your home! What do their community favourites Sunburst Clock, Sunflower Clock, Ball Clock and Eye Clock have in common? Guessed correctly! They all come from the pen of the Swiss design office Vritra and enchant your home with their timeless, noble design. For example, the Ball Clock, with its clear yet playful design idiom, is a trailblazer for forward-looking design from America in the 1950s. The Sunburst Clock by Vritra is the perfect wall clock for living room or dining room and gives your apartment with its filigree teeth a lively and light ambience. The perfectly formed watch is available in solid colour or multicolour and looks most beautiful against wood or against a white background. Extravagant: play with shadows and stage the black Sunburst Clock against a dull black background. High-quality design classic: The Sunflower Clock is a legendary wall clock from the 1950s, designed by the architect George Nelson for the manufacturer Vritra. In addition to a high-quality quartz movement, the designer watch captivates with its delicate, complex shape that is reminiscent of a full-blown sunflower. The clock looks best against a bright wall in the bedroom or living room, as it casts charming shadows.